What do you think of this list? What else would you add? Love the list. Love the articles. And especially love the recipe. 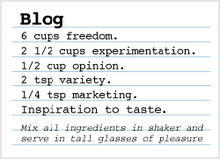 After blogging for over a year, I have to say that figuring out the 6 Cups of Freedom part was how I discovered the pleasure in it. I stopped "trying" and started feeling. What a great reminder about what's fun about blogging -- it's all about freedom. Freedom to write what you want to write, say what you want to say, in the way you want to do it. Thanks for sharing your perspective, Dana. As a new blogger I loved all of the information here. He talks about how the purpose of a blog is to develop community. Using the words "we" and "us" instead of "I" and "you" will help draw people in. I want to be mindful of creating that community. I am totally with you on building community, Marlene. It's so important to do that, especially for home-based small business owners who are often home alone.